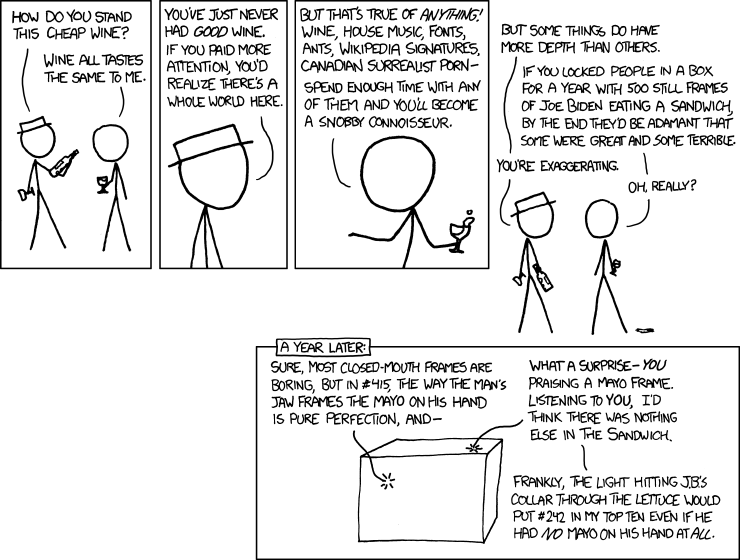 Today's XKCD quite correctly points out that if you're unfamiliar with some aesthetic experience (his example is wine), you're willing to tolerate any cheap crap, but once you have some experience, you tend to develop some taste. Inevitably, you find yourself preferring some varieties of that experience more than others. Arguably, developing taste is a good thing, since, as Munroe has his character suggests, it opens up whole new vistas to you—albeit at the risk of turning you into an annoying snob. Of course, the mere fact that you're shelling out more money doesn't necessarily mean you're worse off, since the counter-argument would go that you're getting more hedonic value out of the better product. I'm not sure that's true, though, since you habituate so fast. When I first started eating sushi, I was happy to eat the cheap stuff, but now that I've had reasonably good sushi, I'm not prepared to go back. Seems like a good reason to stay away from Masa.